My shiny new copy of Love at First Stitch and the bargain fabric I wrote about it my last post have been keeping me super busy this week! 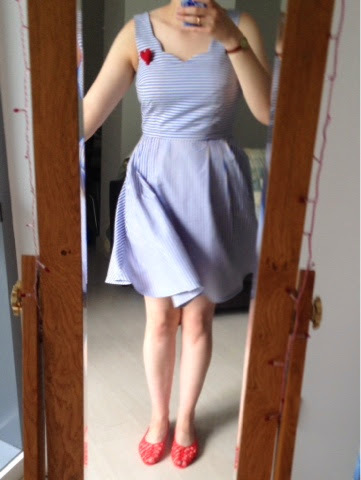 Pins and scissors ready, I jumped straight into making the lovely Lilou dress so I could have it ready to take on my holiday. 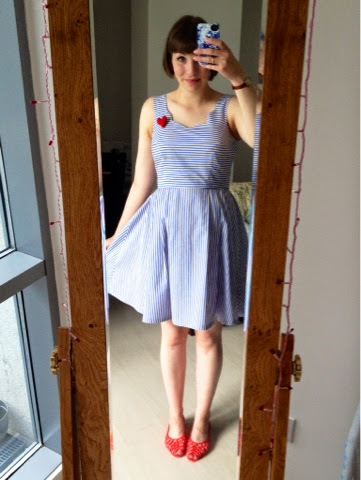 The stripe fabric I used is a lightweight cotton - pretty good for what is officially my first me-made summer dress! I love scalloped edges. I seem to spot lovely scalloped-detailed garments in shops like Hobbs all the time, but then I always have the 'Ohhh can I justify spending this much..?' debate. 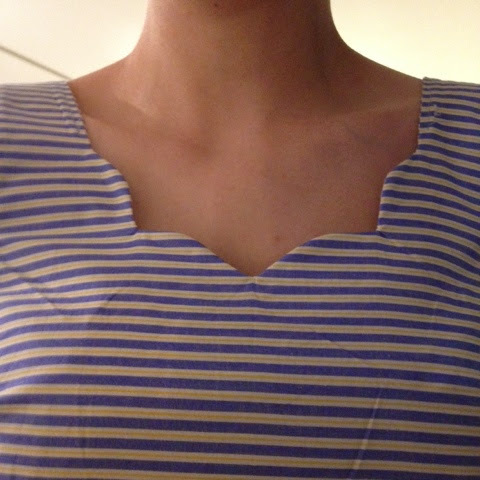 So I was thrilled to see that one of Tilly's suggested variations for the Lilou dress was to make a scalloped neckline. Tilly provides step-by-step instructions on how to add the scallops to your pattern. I knew that tin of Savers kidney beans would come in handy at some point! (Product placement at its best - other tins are available). 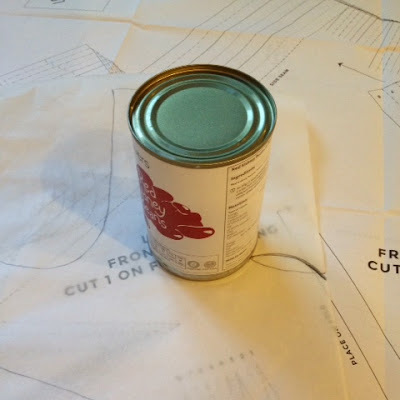 I traced around the tin so mine would be bold and deep. The construction part is SO simple - I think my wardrobe will be full of scalloped edges and trims soon! Love at First Stitch is great because it gives you the confidence to try out these tricks and techniques that you've long-admired, but not quite plucked up the guts to actually do. Sometimes - especially for the not so confident sewist - it's easy to get caught up in sticking to the pattern and following the 'rules'. The book encourages you the reader/maker to 'make it your own' throughout, and that's something I love - even more of that 'I did it myself!' feeling when you've done. One thing I did do was take in the shoulder seams a little to stop a bit of gaping in the back. 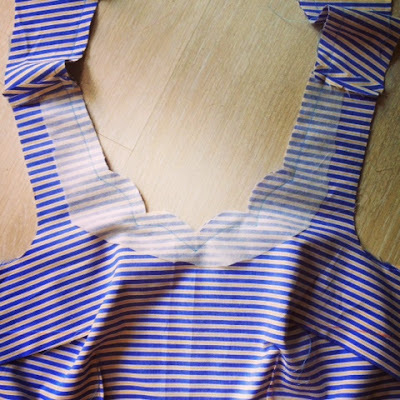 I'd probably take a centimetre off the shoulders on the pattern next time, just to get the right fit for me. And it's done! I'm not sure I'd win any prizes if you inspected the finish up close, but that's my fault for making a few mistakes and being too lazy to fix them. The waist seam at the back doesn't quite match at either side of the zip - it's just a few millimetres out - and not all of my skirt pleats meet the darts on the bodice where they should. But I think you'd only notice these things if you were told (whoops, there I go giving away my secrets!) 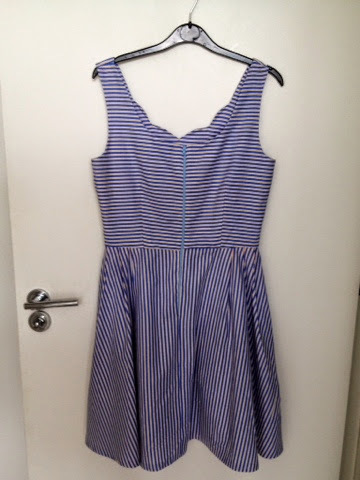 By placing the horizontal stripes on the bodice and vertical stripes on the skirt, I will hopefully confuse the onlooker's eyes so they don't see them anyway - definitely the intention. 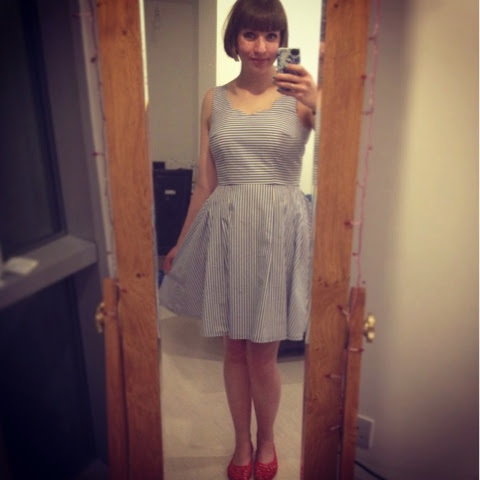 The whole dress has cost me less than £5 to make, and I'd say that the quality is a fair bit better than a cheap dress from the high street. 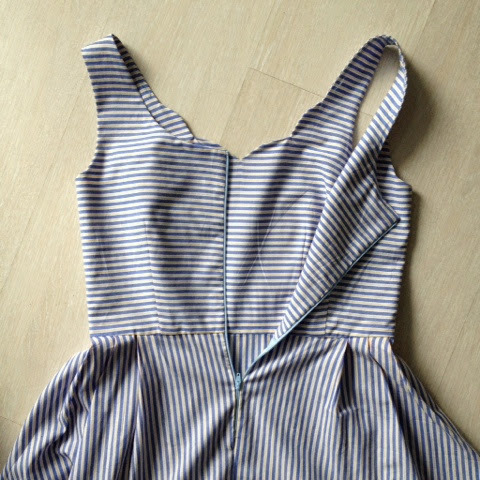 The lined bodice gives it a particularly nice, neat finish - hiding away all the raw edges and dodgy bits! I haven't lined a garment since I did my A Levels, so it was a really useful reminder/practice. The Lilou dress might well become my new wardrobe staple. It's so simple, but at the same time, the results are really pretty - it proves that you don't need to put a bow of distraction on top of everything *cough cough*. You only need 2 metres of your main fabric for the dress itself, (0.5 of your lining fabric) so I definitely plan on having a snoop in the fabric shop and investing in something a bit fancier. Here is a quick view of the back of the dress too. Eagle-eyed readers may spot some slightly out stitching, but oh well! ...OH YES IT DOES. Adiós! I love this! It's so pretty! I got my copy last week and have already made two skirts (I am NOT good at zips!). 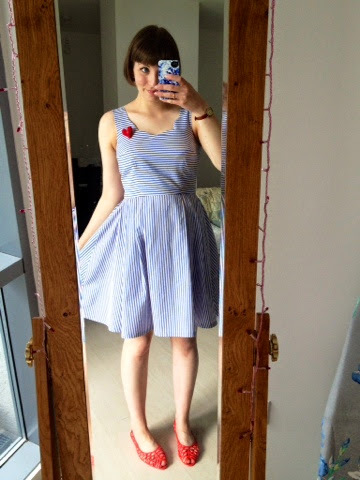 I want to make a Lilou in gingham next! Enjoy your holiday! love everything about this dress, especially the way the stripes are vertical on the skirt. 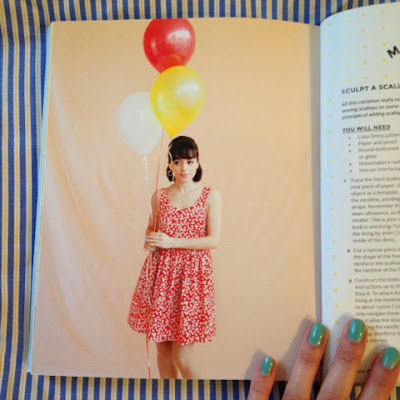 I have the book and really want to make the Lilou dress too! Cute! It looks gorgeous, especially with the scallops. Can't wait to get cracking on this pattern too! J'adore your dress, Shauni! Just found it on a pinterest search for Megan Dresses actually (ha!) but I really like the look with the wee stripes and the fab brooch just finishes it off. Lovely!